Two young people fall in love, get married, have children and a house. Suddenly they find themselfs lock in this stereo type life. They try to escape, but it turns out to be complicated! 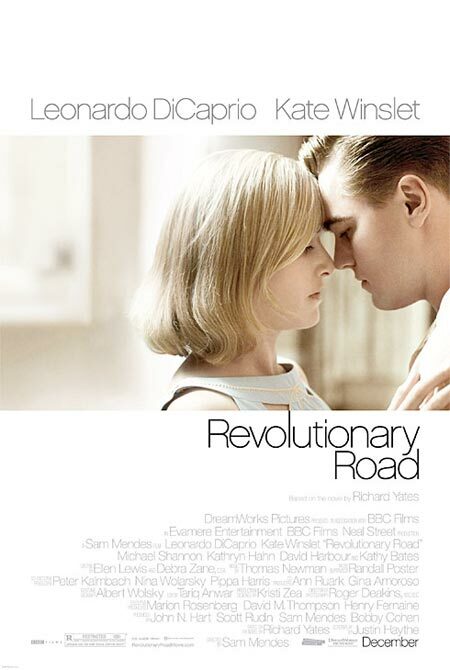 For me Revolutionary Road was the best movie of 2008. Kate Winslet is absolutely amazing and Leonardo DiCaprio is excellent too. I still can't believe Winslet didn't win her Oscar for this movie (edit: instead she won for The Reader) and that Michael Shannon didn't win for best supporting actor. Shannon isn't on screen for many minutes, but his performance and impact on the movie is absolutely incredible. I think a lot of people are in a similar situation to the couple living on Revolutionary Road and I think the direct link to so many families today is what's making this movie feel so extremely contemporary even though it's set in the 1950s. I don't think anyone will be able to watch this movie without reflecting upon their own situation. Most likely pointing a big fat spotlight on the things you didn't achieve or the dreams you know will never get fulfilled. You definitely don't wanna be in mood for Titanic when setting down and watching this one. I had heard that it was very different, but because of Leonardo and Kate, I kind of expected it anyway. BUT IT IS NOT A HAPPY-GO-LUCKY movie. If you have partner in your life and you're about 30 years old, I'll bet this movie will rock your feelings and maybe your world a little bit. And it makes you ask yourself: Do I live my life? 8 of 10 for making me think and on it's way to do that giving me good acting and realistic and grim story, wrapped in wannabe happiness.